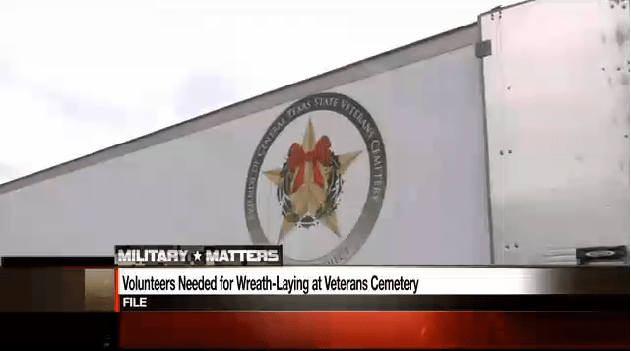 Killeen, Texas — Show support of America’s veterans by volunteering to assist the Friends of Central Texas State Veterans Cemetery (FCTSVC) for the annual holiday wreath project. Each year family members and community volunteers gather to prepare and then lay a wreath on each gravesite at the cemetery to remain on display during the holiday season. “In laying a wreath in our cemetery, we lay a wreath for all veterans throughout the world,” said Jean Shine, president of FCTSVC. Saturday, November 22 is the wreath preparation at 10 AM in the Killeen Special Events Center at 3601 S WS Young Drive. Community members gather and quickly prepare all the wreaths for the ceremony on the following Saturday. Preparation includes attaching the bow and assuring that each wreath is in proper condition for display. Always the Saturday after Thanksgiving , the ceremony this year will be November 29. The small, simple ceremony begins at 10 AM and then 3 separate groups of people lay wreaths on gravesites. The first group will lay large wreaths on the monuments that represent all of the Ft. Hood soldiers who died during the current wars – even those not buried at the cemetery. Next, family members will lay a wreath on their loved ones gravesite. Last of all, the group of community volunteers will fill in the thousands of graves that don’t have representatives present. Jean Shine wants to make sure everyone knows that volunteers are needed for this project. “Please help us ensure that everyone is remembered this holiday season,” Shine said.